Everytime I fly down to Los Cabos--which isn't often enough given it's only a two-hour flight from Los Angeles--I quickly remember why I love this Mexican destination. The people are unbelievably friendly, the hotels are first class, the food is delicious and the sea-meets-mountain setting is simply stunning. Accommodation options in Los Cabos run the gamut from small luxurious boutique hotels to larger full-service beachfront resorts, private villas and over-the-top residences (more on this later this week!). 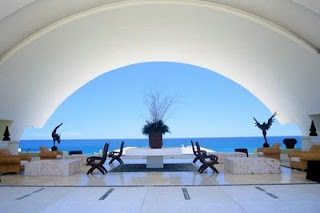 The newest addition to my list of favorite luxury hotels is Marquis Los Cabos, a 237-suite property steps from the Pacific Ocean. I especially love the 28 private casitas and the five Marquis suites, each with a private pool, patio or sundeck, spacious kitchen/dining area, huge baths with jacuzzi tub, intricate stone floors, handcrafted woodwork, original Mexican artwork and private butlers. There's no such thing as a "standard room" here; rather, rooms in the main building are laid out like junior suites, and each features terraces, ocean views and pull-out sofas (perfect for families). Dining options include the oceanview Vista Ballenas and Canto Del Mar, a beautiful intimate restaurant serving Chef Thierry Dufour's six-course tasting menu that changes every three days. Al fresco dining by the three outoor infinity pools is of course, also an option. A holistic Spa Marquis, outdoor yoga classes, unique Mayan therapies, a spacious fully-equipped gym and complimentary WiFi are other things I am loving about Marquis Los Cabos. Limited availability still exists for Christmas; it's an ideal spot for families, couples and groups of friends seeking a warm-weather holiday vacation option! Note: no minimum stay requirement is in place which we think is a very smart move by General Manager Ella Messerli. For more details or to inquire about time-sensitive promotions special rates and exclusive perks, contact us via email at elitetravelgal@gmail.com. This, in part, is why Los Cabos is so highly regarded as one of the world's top places to visit?